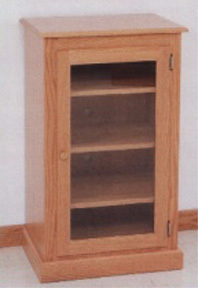 Looking for an Amish made solid oak audio cabinet for your stereo system or other electronic gear? Well, our #616 oak audio cabinet is a fine piece of furniture, handcrafted by the Amish, of course! This one features 3 adjustable shelves, and an oak door with 1/8” clear glass window, and will be a very attractive addition to any room. The cabinet and shelves are solid oak, and it has an oak veneer back. It can be used as a standalone unit, or will be the perfect compliment to one of our Amish made TV stands - you can even get it as a combo with our wide TV stand (pictured one page back from here).